Health Matters will be an ongoing blog category that presents and discusses the multitude of issues that pertain to health and healthcare, including the ethical and political dimensions of our healthcare system. Stay tuned! It’s cold and flu season – try using essential oils to ease your symptoms and keep the rest of the family healthy! Essential oils are very versatile and can be used in many ways to treat many common health issues. To use them effectively, you need to be aware of safety issues, proper dilutions and appropriate methods of application/administration. Essential oils are highly concentrated complex compounds derived from many different kinds of plants. Essential oils come as ‘singles’ meaning the oil is from a single plant species, or ‘compounded’ which is a mixture of oils from different species of plants. Always buy pure essential oils that contain no synthetic ingredients and have not been chemically processed. NOW brand essential oils are high quality and reasonably priced. NOW essential oils are readily available at Natural Grocers (best prices) and New Seasons Market. 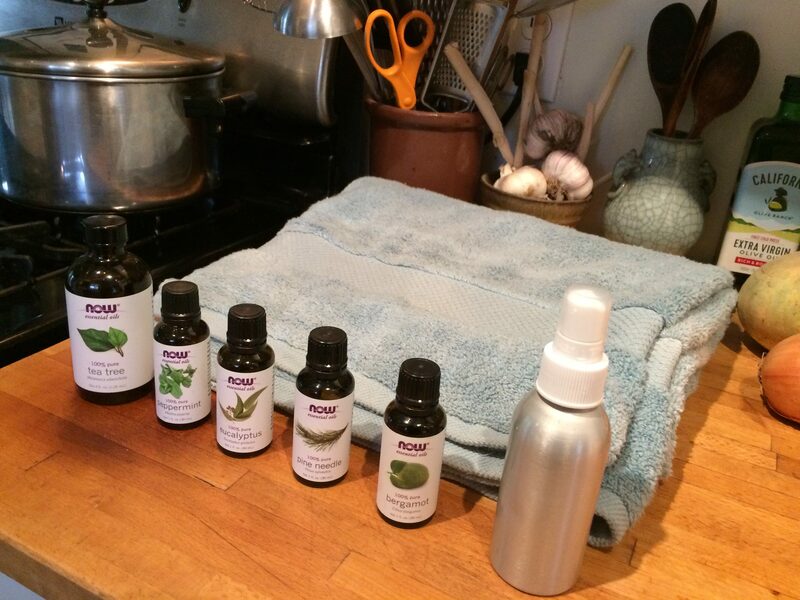 The following essential oils can be used to make a disinfectant room spray, used as a steam inhalation and used to make a chest rub. All 3 recipes make use of Eucalyptus, Tea Tree, Bergamot, Peppermint and Pine Needle essential oils. All of these oils have immune enhancing and strong antimicrobial properties (kill viruses and bacteria). This has a pleasant smell and is very antimicrobial to help keep you and your family healthy. Spray liberally around the house and on surfaces such as doorknobs etc. to keep down the spread of illness in your home. Combine ingredients in a small pump bottle (metal is best). Shake well before each use to suspend the oils in the water. This is excellent for lung symptoms of cough with mucous congestion. Use the same dosage of each of the essential oils as in the previous recipe, but replace the water with 1 ounce of an oil such as jojoba, almond, apricot hazelnut, grapeseed, or even olive oil. You decide which oil. Combine all of the ingredients in a small glass jar with a tight fitting lid. Shake well before applying to the skin of the chest area. This is superb for sinus infections, nasal congestion from allergies, and all upper respiratory illnesses and head colds. Added bonus, you get a steamy herbal facial at the same time! This recipe is not quite as specific or exacting as the previous two recipes because there are variables that I cannot account for, such as the size of your pot and the volume of water used. So I give a range of amounts, start at the low end and adjust as needed. If you are overwhelmed by the scent of the steam, you have used too much essential oils. If this happens, add some hot water to the pot to dilute. Bring a large pot of water to a boil (it does not have to be full!). The pot should be large enough that your entire face fits over the pot with a bit of room to spare. Drape a large bath towel around your neck. Put the essential oils into the water, and put the lid back on the pot. Use the bath towel to make a tent over your head to create a mini‐sauna. Remove the lid from the pot. Place your face over the pot and with your eyes closed (so they don’t get irritated), breath deeply through your nose. Repeat inhaling until you need to take a break and put the lid on the pot to keep the volatiles of the oils in the pot. Take a few moments to rest. Remove the lid and do more inhalations. Repeat until you feel that you’re done or that the water has cooled off and there is no steam to inhale. Because the active ingredients in the essential oils are volatile, this water can be re‐used, BUT you will need to add more essential oils. I hope you find these ideas helpful. And if you need additional support for your immune system, consider acupuncture. Acupuncture can help enhance proper immune function and supports the whole body for total wellness.